Wednesday is share day! Let's take a look at what'cha been workin' on, shall we!? This week is all about the kids - we're talking playful, fun & colourful restyles! 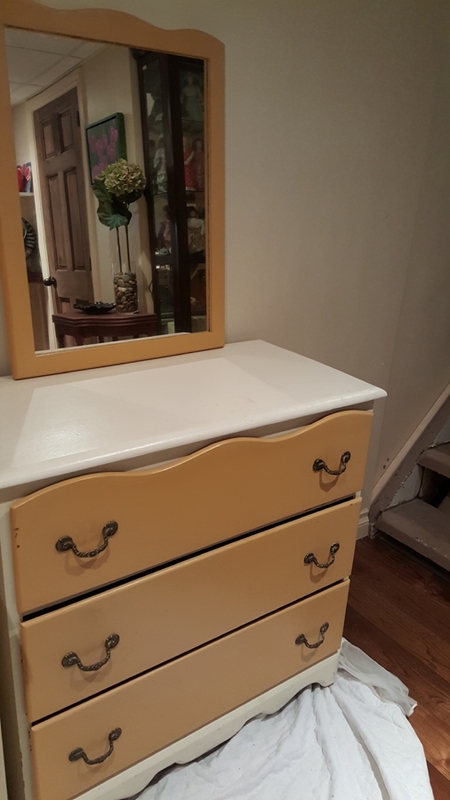 First up this week is a sweet little dresser restyled by Amanda. . . I mean seriously?!? I LOVE, LOVE, LOVE the stripes on this dresser! Going with a white base is always a good idea if you plan to have a little fun with pattern. Amanda picked up sample pots of van Gogh in various colours to create this effect. The soft colours of the chevron pattern look so crisp and adorable against the white! Thank you so much for sharing this Amanda - great colour palette, great idea, great job! Here's a shot of the 'before' . . . . ho, hum . . . . 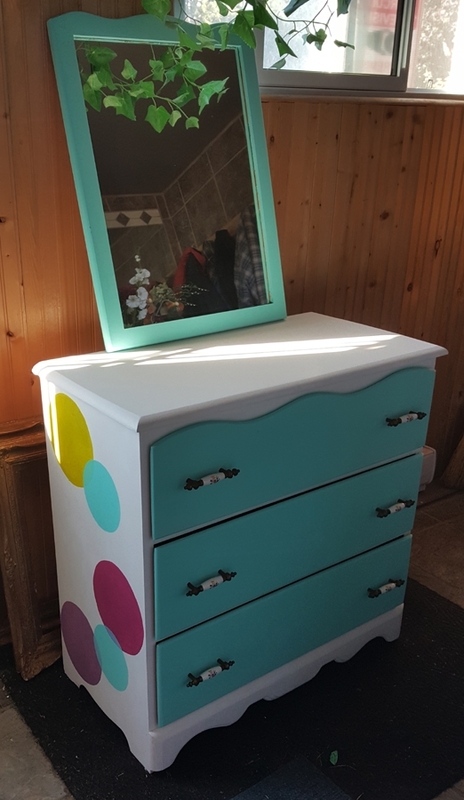 This next set (dresser and desk) were restyled by Diane for a sweet little 5 year old in her life . . . again a nice solid white framework lets the polka dots do the talking! Diane used our popular van Gogh chalk based paint in 'Halo' white and brilliant 'van Gogh' blue as the main colours for these pieces. I bet there were squeals of delight when Bella saw her pretty and fun new bedroom set! Thank you so much for sharing Diane - great job! I'm lovin all the creativity! And the 'before' pictures . . . not too bad, but nothing to write home about . . . Here's a fun one for you! Heather picked up this adorable play house second hand for her kids. I mean it was pretty cute to begin with, but check out the finished product on the right hand side! So cute and vibrant - what kid wouldn't want to hang out here?? Heather used Miss Mustard Seed's Milk paint in some great colours to restyle this play house to go with their existing backyard decor. I think it's adorable - thank you for sharing Heather! And last but not least this week is a cute little craft project by Nicole. After picking up these simple frames, she upped their style factor for her niece and nephew with some van Gogh paint, TLC and creativity. Lucky kids!